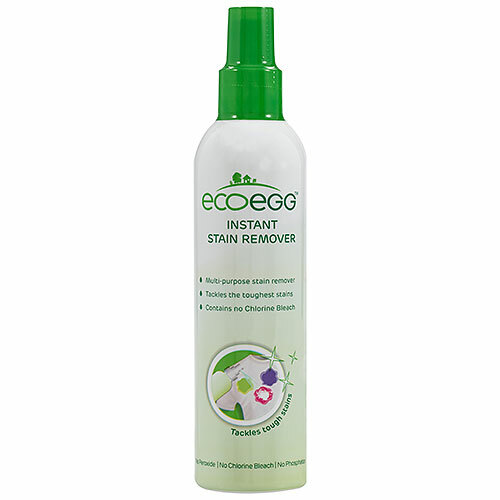 Ecoegg`s Instant Stain Remover is so effective with hardly any effort required from you. Watch it cut through stains with just a few sprays - amazing! It will power through all kinds of stains no matter how long they have been there, what kind of fabric they are on, or whether they are fresh or dried in - and you will still be amazed by the results every time! Works on anything from a leaked fountain pen on a white shirt, to strawberry stains on your children’s clothes, and even red wine stains on your tablecloth. Contains amongst others: 5-15% Non-ionic surfactants. For best result, treat stain as soon as possible. Remove excess liquid/dirt and moisten with water. Apply enough Ecoegg Instant Stain Remover to treat affected area. Rinse to remove all residue. Repeat as needed. If in eyes: Rinse cautiously with water for several minutes. Remove contact lenses, if present and possible to do so. If irritation persists, seek medical advice/attention and show this container or label. Below are reviews of Ecoegg Instant Stain Remover - 240ml by bodykind customers. If you have tried this product we'd love to hear what you think so please leave a review.